Prices may vary depending on your hair length, condition, or hair stylist. For DevaCurl Services, Click Here. SUGARSHINE Polishing Hair Scrub stimulates each strand of hair with sugar crystals -a natural humectant that nourishes each strand of hair. Add a dose of SUGARSHINE Mega Gloss and indulge in a relaxing scalp massage that improves scalp circulation, soothes tension and boosts your mood! Leave the salon free of stress with beautifully soft and shiny hair. The Malibu Treatment is great for swimmers and well water. It removes the build up of impurities in the hair. The Scalp Treatment includes the use of Monat Treatment Systems to help exfoliate the scalp and stimulate circulatioin to the scalp and hair folicles. Recommended for all hair types. (ie: 1 hour 15 minutes = $100.00) All hair, glue, or thread must be furnished by the client. Additional cost for Updo, F/I, HC, etc. Based on Consultation. Deposit required. Sarah offers Glam Seamless Hair Extensions. The best to maintain the health of your hair. 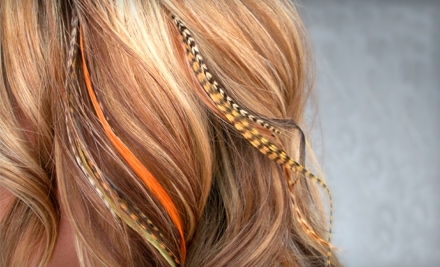 We use high quality real feathers. You can style them and treat them just like your natural hair. Silicone-free shampoo provides a gentle lather and silicone-free conditioner adds lightweight moisture. A dose of SUGARSHINE Melga Gloss Treatment and a hot towel wrap top off this treatment. Leave the salon with shimmery hair that glows. *Includes Olaplex Treatment dramatically reducing breakage for lightened hair. **If going lighter than your natural color there is an additional $10. charge to cover the Olaplex Treamtent.